Political pundits believe the Samajwadi Party's win will work as a launch pad for the formation of an alliance of Opposition. 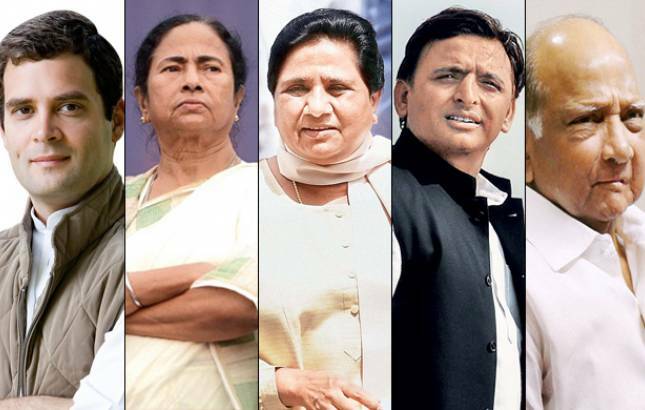 The fall of Gorakhpur, a BJP citadel, and Phulpur Lok Sabha seats to the Samajwadi Party (SP) backed by the Bahujan Samaj Party (BSP) in the bypolls is working as a catalyst to form a ‘mahagathbandhan (grand coalition)’ against the saffron party for the 2019 general elections. Political pundits believe the Wednesday results in which the BJP lost four out of the five seats in the byelections will work as a launch pad for the formation of an alliance of Opposition looking forward to stop the BJP gaining numbers in the 2019 general elections. Soon after the results were declared for the bypolls SP chief Akhilesh Yadav called a press conference and thanked BSP president Mayawati for not fielding candidate in the two Lok Sabha seats. Setting aside the 25 years bitter rivalry, he drove to her residence in Lucknow’s Mall Avenue and thanked the BSP supremo. The party chiefs of both the leaders were together for about 20 minutes. It is yet not known what was discussed between the leaders. However, SP and BSP leaders hinted that the two discussed on various coalition possibilities. The Congress candidates fielded in Phulpur and Gorakhpur lost their deposits but their party chief Rahul Gandhi was happy with the last moment coalition of BSP-SP stopped BJP’s win wave at the two high profile Lok Sabha seats which had been won by a margin over 3 lakhs votes in 2014 by Uttar Pradesh Chief Minister Yogi Adityanath and his deputy, Keshav Prasad Maurya. “It is clear from the results that voters have a lot of anger against the BJP and they will vote for the non-BJP candidate who is most likely to win,” Rahul Gandhi tweeted. Post the bypoll results, the Congress president met met NCP chief Sharad Pawar to discuss the emerging political developments and possible coalition to fight assembly elections in Maharashtra. Mamata Banerjee after Tripura assembly poll results had said that the Congress performed poorly only because it did not ally with Trinamool Congress and other hill parties against the BJP. To appease Mayawati, the Congress president on the birth anniversary of BSP founder Kanshi Ram gave him tributes. "Honourable Kanshi Ram was a great social reformer. His tireless efforts to connect the suppressed communities with politics has left an indelible impression on Indian politics," Rahul Gandhi tweeted. However, several regional political parties standing against the BJP are yet to confirm their stand on the grand coalition. Even the BSP and SP did not clarify a future partnership in the state.